The scene of a Laudholm Farm Wedding is something to behold. The Laudholm Farm is a restored saltwater farm with a rustic barn, stunning views, and spacious grounds that provide an incredible backdrop for a wedding celebration. The expansive lawns and wrap-around porch of the historic farm give a Laudholm Farm Wedding its quaint, coastal Maine feel. 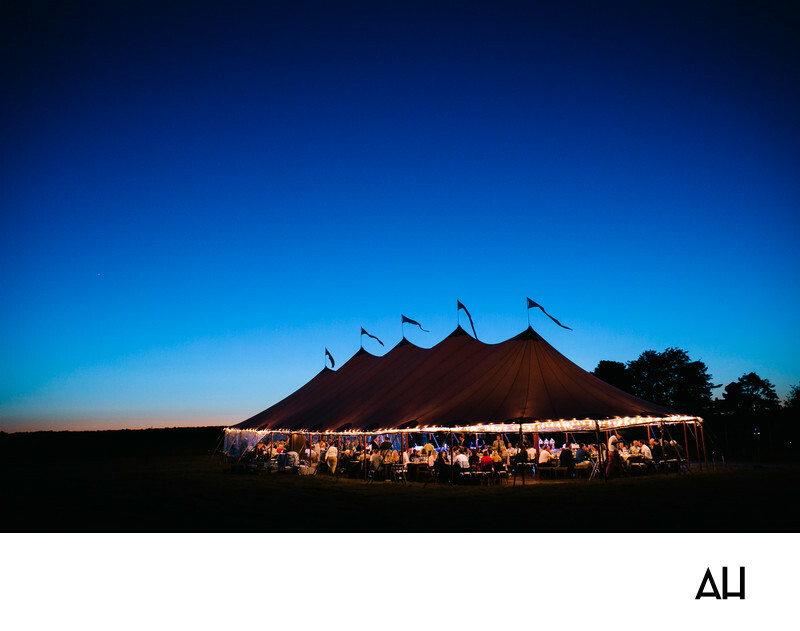 For receptions, an enchantingly lit tent is setup to give the night some pizzazz, without taking away from the natural beauty and character of the farm setting. As seen in the above picture, the tent canopy looks like something out of a storybook. White fairy lights adorn the ceiling, illuminating the wedding guests as the sun sets. The flags on the roof seem to wave goodbye to the sun as it disappears behind distant hills, splashing the sky with color, while the guests stand from their seats to dance. The image gives the impression that the wedding party is the only sign of human life for miles, and it is a very happy sign.